When I was in Singapore, I met a man about 50 years old who told me that he used to suffer from diabetes. But now, his blood sugar level is normal for few years- and so he took it as a sign that his diabetes has been cured. You need not squeeze so much of lemon till the water is very sour. Just something that you can comfortably drink. This man shared with me that he had gotten a number of his family members to drink this and it seemed to help them too (he has a strong family history of diabetes on both his and his wife’s side). Lemon is a great fruit for detox- squeezing a little lemon into a glass of warm water and drinking it first thing in the morning on an empty stomach work wonders. You may find a lot of ailments that are tied to a sluggish digestive track seemed to go off. Even problems like sinus, fatigue, constipation and certain skin allergies would improve after taking a mid diluted glass of warm lemon water on an empty stomach. Give it at least 15 minutes before you take your breakfast. It would also strengthen those with weak kidneys. And please use real freshly cut lemons– not the bottled lemon juice that contains sugar that would make it worse. However, if you are undergoing treatment for diabetes, kidney or digestive track problems, please check with your doctor if the above remedy is safe to use before you apply. Can the normal yellow lemon work? For lemon juice already squeezed but not consumed within the day, is it ok to use the next day if kept in the fridge? 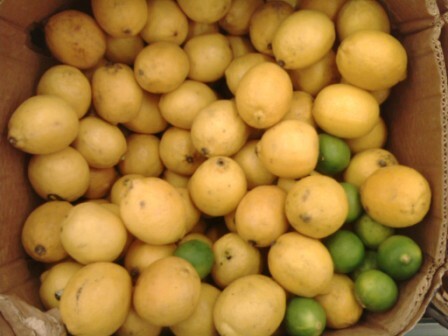 Not sure though about yellow lemons- I was only told by the guy that he uses the green ones from Australia. But you can give it a try. It’s better not to keep it overnight as oxidization may occurr. It’s just like if we squeeze orange or apple juice- normally we would not drink if it is left overnight. As for the cut lemons, you may use again. And don’t drink chilled water- take water a little warm or at least at room temperature. I live in Jackson Tennessee.Are Australian green lemons even sold in the United States? I looked into it and everyone kept saying that a green lemon is a lime but that can’t be right, can it ? Is there a website or a company that I can contact ? But you may try with the yellow lemon or lime. I hate to be a cynic – but I highly doubt lemon water has some sort of magical property that cures diabetes. That being said, drinking a glass of lemon water in the morning instead of having a donut and an extra large Starbucks “coffee” (milkshake) would surely work wonders for controlling your blood sugar levels. Thanks for the input. I would not had believe it had it not been shared to me firsthand by a lady who was convinced of its effectiveness.